Offering Just-In-Time, contract, and on-site services, H & H Polishing has over 50 years of experience in all aspects of metal finishing. Our processes include mechanical, wheel machines, table sanders, belt sanders, lathes, and swing machines, as well as manual metal polishing, to remove grinding lines, scratches, pits, mold marks, parting lines, tool marks, and surface defects. We work on metals such as aluminum, brass, bronze, copper, magnesium, powder metal, silver, stainless steel, steel, titanium, and other alloys and non-metals including acrylic and plastics. Also called Grinding, Roughing or Rough Grinding These finishes are coarse in nature and usually are a preliminary finish applied before manufacturing.An example would be deburring or removing excess weld material. It is coarse in appearance and applied by using 36-100 grit abrasive. When the finish is specified as #3, the material is polished to a uniform 60 - 80 grit. Also called Brushed, Directional or Satin Finish A #4 Architectural Finish is characterized by fine polishing grit lines that are uniform and directional in appearance. It is produced by polishing the metal with a 120 - 180 grit belt or wheel finish and then softened with an 80 - 120 grit greaseless compound or a medium non woven abrasive belt or pad. This finish is commonly used for the medical and food industry – almost exclusively used on stainless steel. This finish is much finer than a #4 Architectural Finish. Great care should be taken in removing the surface defects in the metal – like pits – that could allow bacteria to grow. A #4 Dairy or Sanitary Finish is produced by polishing with a 180 - 240 grit belt or wheel finish softened with 120 - 240 grit greaseless compound or a fine non woven abrasive belt or pad. This finish is produced by polishing with a 220 - 280 grit belt or wheel softened with a 220 - 230 greaseless compound or very fine non woven abrasive belt or pad. Polishing lines should be soft and less reflective than a #4 Architectural Finish. A #7 finish is produced by polishing with a 280 - 320 belt or wheel and sisal buffing with a cut and color compound. This is a semi-bright finish that will still have some polishing lines but they should be very dull. Carbon steel and iron are commonly polished to a #7 finish before chrome plating. A #7 finish can be made bright by color buffing with coloring compound and a cotton buff. 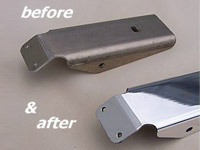 This finish is produced by polishing with at least a 320 grit belt or wheel finish. The part is sisal buffed and then color buffed to achieve a mirror finish. 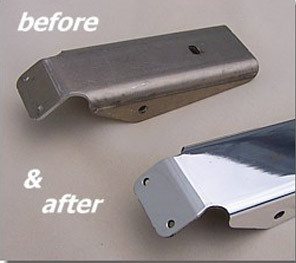 The quality of this finish is dependent on the quality of the metal being polished. Some alloys of steel and aluminum cannot be brought to a mirror finish. Castings that have slag or pits will also be difficult – if not impossible – to polish to a #8. The following table outlines our complete grinding, polishing, and buffing service. Please contact us to learn more.